Big arms are mainly about triceps so in order to build massive arms forget about the biceps being priority because they aren’t. The triceps make up approximately two thirds of the upper arm mass and should be prioritised. In order to build the triceps you need to know that compound moves which can be more heavily loaded are most effective at building mass and therefore superior to isolation work. 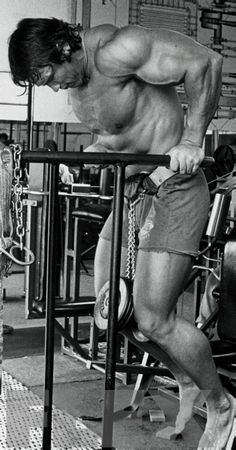 Compound moves that hit the belly of the muscle are most effective for example Narrow Grip Bench Presses and Weighted Dips. The JM.Press is another great movement. Of the isolation exercises Overhead Tricep Cable Extensions (with either a rope or bar) are most effective at stretching and building the rear head of the triceps. Around 8 to 12 reps is optimal range for tricep hypertrophy. To build big biceps your core move should be a compound exercise that recruits the biceps as part of a larger movement, for example chins (preferably weighted). Exercises which isolate the biceps should also be utilised. Avoid excessive volume – sometimes less is more, the biceps is a relatively small muscle and doesn’t require lots of sets to grow. In fact too many sets are counter productive and lead to overtraining. Additionally utilise exercises that build the brachialis muscle which lies underneath the bicep – this will result in your arms becoming thicker. The most productive exercises for this are Neutral Grip Chins and Hammer Curls. Also increase range of motion by using incline bench for Seated Dumbell Curls – Incline curls are great mass builders also. © Denys Kovtun | Dreamstime.com – Champion doing pull-ups. Give these workouts a try in order to build massive arms of the sleeve splitting variety. Nail down your nutritional needs and be sure to ingest a good protein supplement within an hour post workout. Even more importantly, get your rest – you grow when you sleep not when you workout. Try to get 8 hours minimum quality sleep every day. Very great post. I just stumbled upon your weblog and wanted to mention that I have really enjoyed surfing around your weblog posts. Thanyou, and feel free to e mail me at coach@mythslayer.uk if you have any burning questions.